My recent first visit to see the A.D. Players was long over-due. My friend Ray from New York had spent much time in Houston, and he had told me some time ago about this marvelous troupe while recommending I check it out for myself. Last Saturday night at the Grace Theater I finally had the opportunity to sample the theatrical excellence that has sustained this fine company for now 47 seasons. 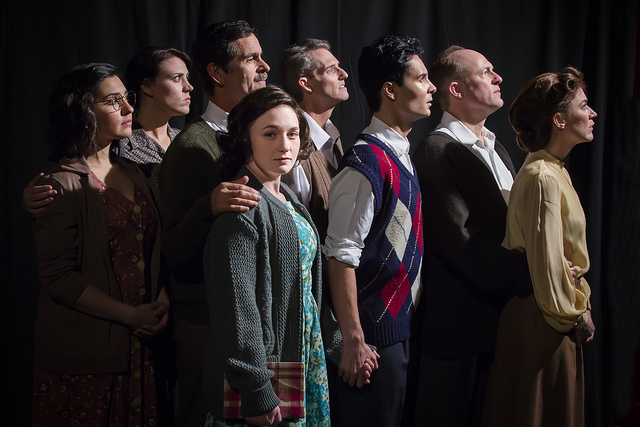 The production is a marvelous revival of The Diary of Anne Frank by Frances Goodrich and Albert Hackett, and brilliantly directed by Tawny Stephens. In 1956 the original Broadway production won the Pulitzer Prize, the Tony Award, and the Critics Circle Award. It would be hard to imagine that production being any more compelling than this superb edition. It is wondrous, and the performances are uniformly magnificent, but what is perhaps most surprising is that such a serious drama can be at once so heartbreaking, while at the very same time being so uplifting. Such is the case in this epic tale of eight Jews trapped for over two years in the hidden upper rooms and attic of an Amsterdam warehouse/office building. (The austere and authentic set design from Robin Gillock is dramatically accented by the shadowy lighting designs of Andrew Vance.) What follows is the harrowing tale of these eight courageous souls and their desperate attempt to avoid capture by the Nazis during the waning days of World War II. My first exposure to this frightening story was as a young boy when I saw the 1959 film of the same name, directed by George Stevens. To this day I can still recall the horrifying sound of the Nazi sirens racing through the streets below the confines where these terrified war refugees were hidden. 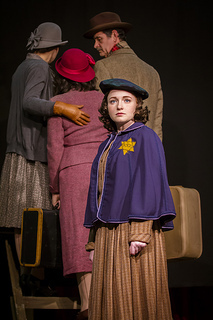 The central character in this drama is, of course, young Anne Frank herself, played here with splendid sensitivity and coming of age enthusiasm by Jennifer Gilbert. Her performance (as the real life thirteen year-old girl who documented these events in her now legendary diary) is so full of life, so overflowing with joy and optimism in the face of extreme hardship, that it cannot but lift one’s faith in humanity, the Nazi horrors not withstanding. The characters trapped here with Anne include her father, affectionately played by Ric Hodgin, her patient and understanding mother (Jennifer Dean), and Anne’s older sister, Margot (a gentle and subtly understated performance from Melissa Molano). In addition, we have Mr. Frank’s friends, Mr. & Mrs. Van Daan (Craig Griffin and Christy Watkins) their son, Peter (handsome Braden Hunt in a wonderfully sensitive portrayal), and a quirky dentist named Mr. Dussel, with Stephen Hurst alternately bringing the dynamics of both comedy and terror to his fine performance. Nicely rounding out the cast are Kurt Bilanoski as Mr. Kraler and Leslie Lenert as Miep Gies, two kindly Dutch souls who regularly bring food, supplies and cheerful encouragement to these imprisoned refugees, all the while carefully keeping the secret of their location. Designed by Donna Southern Schmidt, the fine 1940’s period costumes are accented by the Nazi-required Star of David patch that each Jew must wear. That patch warns the populace that these people are forbidden many basic rights, and cannot even ride in a streetcar, let alone drive a car. Jews are disappearing day by day at the hands of the Nazis, and so it is that this valiant band is seeking sanctuary. The plot begins shortly after the war when Mr. Frank returns to the hiding place and his daughter’s diary is discovered there. As he begins reading it we are drawn back in time via the flashback action that comprises the rest of the play. We see the warm relationship between Anne and her father, and then Anne’s growing friendship with Peter as that relationship blooms into a darling and poignant story of shy first love. Their scenes together are brilliantly acted and directed, and their innocent first kiss is one you will not soon forget. There are powerful performances from both Griffin and Watkins as sparks of tension fly between Mr. and Mrs. Van Daan over the value of a fur coat, the dwindling supplies of food, and (for Mr. Van Daan) hard-to-obtain cigarettes. But tensions are often relieved by the amusing wit of the script, and not infrequently, by the comic moments so beautifully handled by Hurst in his role as the dentist, Mr. Dussel. 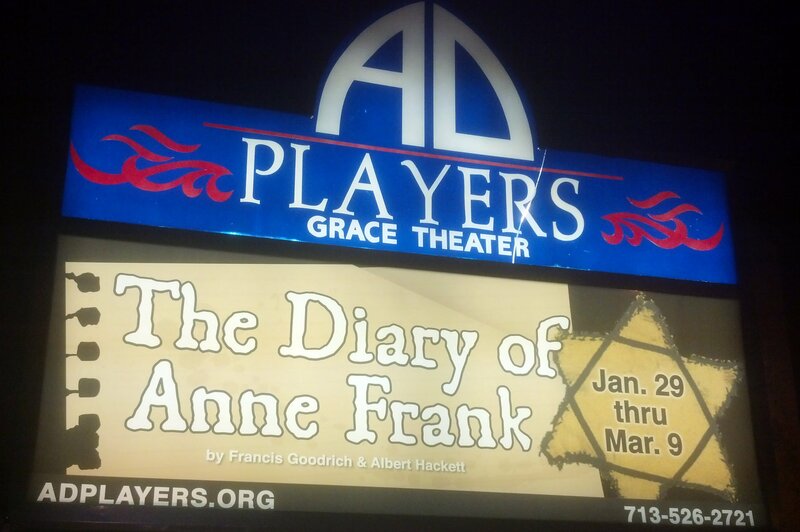 The Diary of Anne Frank continues through March 9th at the A.D. Players Grace Theater, at 2710 W. Alabama in Houston. Performances are Thursdays at 7:30 pm, Fridays & Saturdays at 8:00 pm, Sunday matinees at 2:30pm, and there will be one Saturday matinee at 2:30 pm on February 22nd. For tickets and information visit the website at www.adplayers.org, call 713-526-2721, or visit the theater box office. Prices range from $22 – $43 for single tickets, with group, student and senior discounts also available. 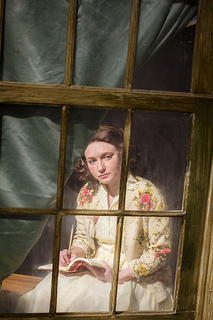 This entry was posted in A.D. Players, Broadway, BroadwayStars.com, Conroe Courier, Diary of Anne Frank, Grace Theater, HERE HOUSTON-Lifestyle & Entertainment, HereHouston.com, Houston Community Newspapers online, The Courier Columns, The Villager Columns, Theater Reviews, ThePeoplesCritic.com and tagged A.D.Players, Broadway, Diary of Anne Frank, Grace Theater, Houston. Bookmark the permalink. A very well-written, non-pedantic review; extremely complimentary to the subject as well as the performance. I love the photography, especially of the ensemble. Well done! Your style has taken on a more sophisticated tone wherein you are complimentary without being fawning; a rare quality among critics, but one which offsets the best from the cloying. Great review Dow! Isn’t it amazing what that small org is doing? Kelli Estes Artistic Director Lone Star Lyric Theater Festival 917-414-9577 | http://www.lonestarlyric.org Lone Star Lyric Theater Festival is a 501c-3 non-profit organization. Re-experience the lyric theater!